When I started this, earlier this year, I had in mind a friend who was heading back to school and setting up an iPad for the first time. That was at the start of the first semester in the Southern Hemisphere, so it is fair to say I have been a little remiss in getting this more substantial collection together. Nonetheless, it is finally here – and in time for a new school year for that other hemisphere, no less. To my mind, these are the best iOS apps for both students and academics. Most of the apps on this list are universal – i.e., they work on both iPhone and iPad, and come as a single purchase. That said, certain workflows tend to suit one device over the other. For example, it is a good idea to use the device with the better camera for scanning and applying OCR to documents. I would also add that like everything on this site, what follows might be pitched in the direction of study and research, but most of these recommendations hold well for all manner of creative and project work. So, fill your boots nerds. 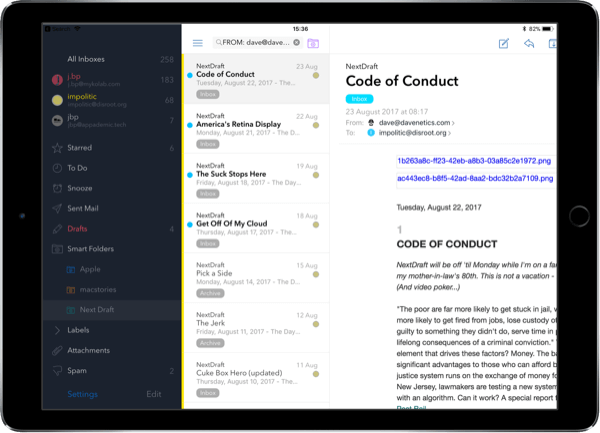 Airmail – My preferred email client, for the simple reason that it includes an unrivalled list of integrations. Adding tasks to any major task manager, clipping emails to DEVONthink, managing attachments, adding notes and so on, it’s all trivial with Airmail. A sound alternative is Spark by Readdle. Fantastical – My favourite calendar app across all platforms. Fantastical has the best natural language engine of any app that I have come across. Even though I love the design of Timepage, I can’t give up Fantastical for the utility and ease of use when it comes to adding events. Todoist – I have covered task-management here. I use Todoist for a few reasons. The clean, minimal design is easy to work with, and like Fantastical Todoist operates on natural language input. 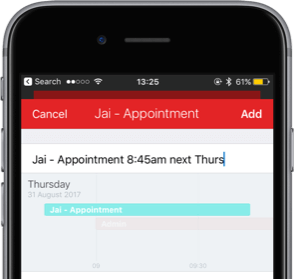 Todoist’s web API also means powerful automation options – for example, with Zapier and IFTT. Due Reminders – Because sometimes it is not enough to have the singular reminders of a task manager or calendar. If there is truly something you cannot forget, Due is designed to pester you until you do it. 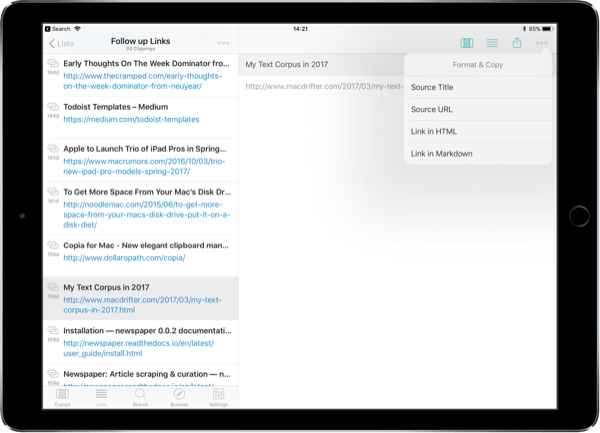 Taskmator – An iOS version of the excellent lightweight, plain text planning app Task Paper. The unique blend of outlining and task management is particularly helpful for planning writing projects. Being plain text, getting information in and out of it is a cinch. PDF Expert – There are a number of excellent options for PDF viewers on iOS, including the free PDF Viewer that will be enough for many people. PDF Expert remains the standard for the fact that you can go further than annotation and actually edit PDF files. I am yet to find fault with its search capabilities, and unlike many apps that create document copies, PDF Expert will edit your files in place. 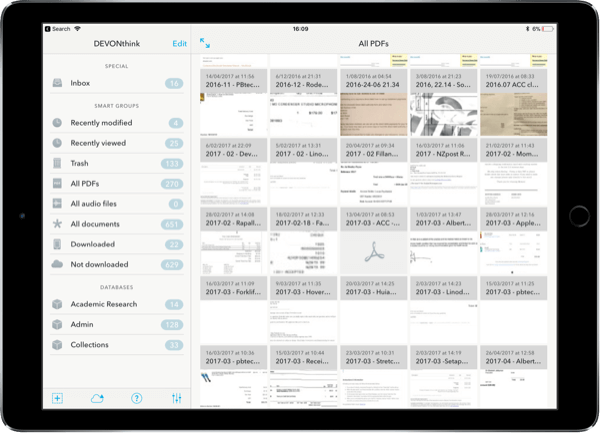 Documents by Readdle – It is possible that iOS 11 will make this app almost redundant, but I suspect it will retain a certain amount of utility. Fo awhile it has been the de facto file management app on iOS, but it also includes local sync services, a Wi-Fi drive, and a download manager that have made it something of a problem solver. Scanner Pro – The last of a Readdle triumvirate. The OCR functionality of mobile scanning apps has improved steadily with the advancement in camera technology to the point where actual hardware scanners are unnecessary for most people now. Scanner Pro is not only one of the most accurate scanning apps, but includes some light automation features. Between scanning articles or books, and digitising forms, either this or Scanbot are very handy. Focus – Productivity Timer – When I first heard of the Pomodoro Technique, I thought it was daft. I have come to realise it continues to gain in popularity for a reason. If you have a dopamine deficit, are easily distracted or given to procrastination when the pressure is on, this is something than can bring a little order to your endeavours. I’m skeptical of anyone who claims to use it to order an entire day, but intermittent use can be helpful. I settled on Focus as the app for the job for its clean layout, and timer synchronisation with macOS. There are many other apps that will do just as a good a job, just don’t go drinking the productivity guru Kool Aid. 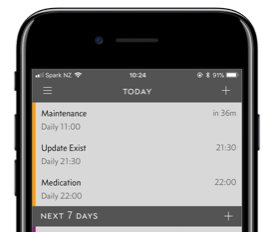 DEVONthink To Go – There are a lot of people who ditched the iOS version of DEVONthink after the release of the first version – which was a bit of a mess – but the app has come along way. Although technically a companion app, even if you don’t use the Mac apps this is an excellent means for data management. Oxford Dictionary – This should be self explanatory, but there are choices to make here. In terms of functionality, Terminology is a much better dictionary app, giving users access to URL based automation and spotlight integration. Unfortunately, non American users might struggle with spelling. It is also worth pointing out that the native iOS dictionary has come a long way, and could well be all you need. Pocket – Eagle-eyed readers will probably notice I have both Instapaper and Pocket on this list, it is true that you only really need one of these apps. My reason for using both is simple, I like to bookmark multimedia content seperate to online reading. I find Pocket best for audio and video. Marvin – It is true that iBooks has come a long way, it still can’t rival the customisation of Marvin. If you use Calibre on the Mac, Marvin can sync with it too. My ebook collection is split between epub and mobi formats, so even though I prefer to read on the Kindle, I have a lot of books that the Kindle can’t decipher. Anything I can’t read on Kindle, I entrust to Marvin. Zinio – If you’re a magazine reader, this is the app you want. If your library has newsstand access, you may be able to access untold free titles via what used to be Zinio for Libraries, but has recently become Rbdigital. The new app doesn’t have the polish of Zinio for discovery, but the reading experience is comparable. Instapaper – I use Pinboard.in to archive everything I want to keep , but Instapaper for more immediate reading. Pinboard can automatically archive Instapaper articles too, if you want to set that up. Apple’s Reading List is getting better all the time, so that might be enough for many people. 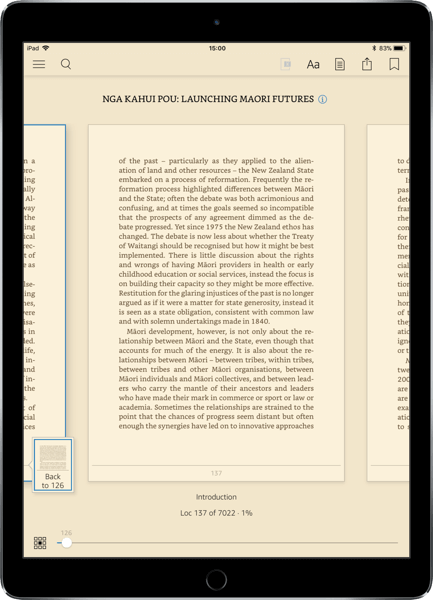 For research purposes, Instapaper gives you a log more control and a better reading experience. Feedly – A little while ago I went on a misguided quest looking for the best RSS tools. Ultimately, I ended up back where I started. To my mind, Feedly has the best user experience of all the services and apps I have tried. The free service is great, but you can hook into all kinds of automation and filtering if you want to part with some spare change. A more powerful option is Inoreader, but their apps leave a little to be desired so you would be best served by using it with a third-party client. My pick of clients is the excellent Reeder app that is available on both iOS and macOS. Nuzzel – If you want the links and articles from twitter and/or Facebook, but don’t want all the noise, then this is for you. It has some annoyances of its own, but I find it to be a valuable source of material. I recently covered writing on iOS, in terms of word processors and text editors, but as you know there is much more to writing than where you put the words. Along with my preferred text editor, what follows are utilities that help with the process – whether that be thinking, planning or editing. Editorial – As I write most often in Markdown, Editorial is ideal not only as a text editor, but for its powerful automation engine. For academic writing, Editorial allows me to format citations as universal citekeys. Outlinely – A purpose built outliner creates structured documents, and by design helps in the organisation and planning of writing. An outliner is useful for all kinds of sequential planning, but shines in the structuring of academic papers. The opinionated, minimalist design makes Outlinely my preferred app for this on both iOS and macOS, but there are other options. At the high end, OmniOutliner tends to get most votes – it is hard to argue with that. MindNode or iThoughts – For mind mapping on iOS, I find it hard to choose between these two. I once read that iThoughts is for ‘power-users’ , but aesthetics is probably the most crucial factor here. Mind mapping is an entirely visual thought process, so you have to like what you are looking at. 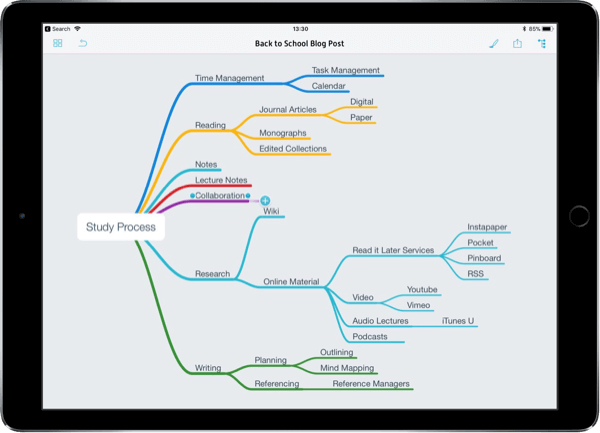 Mindnode is a very clean, slick app – iThoughts is more customisable. A third option is the very tidy Lighten. Day One – I am a late comer to this, but I have come to accept the value of journalling on the development of a writing practice. Writing as close to everyday as possible is one of the best things you can do to improve your writing, and the journal format is liberating. 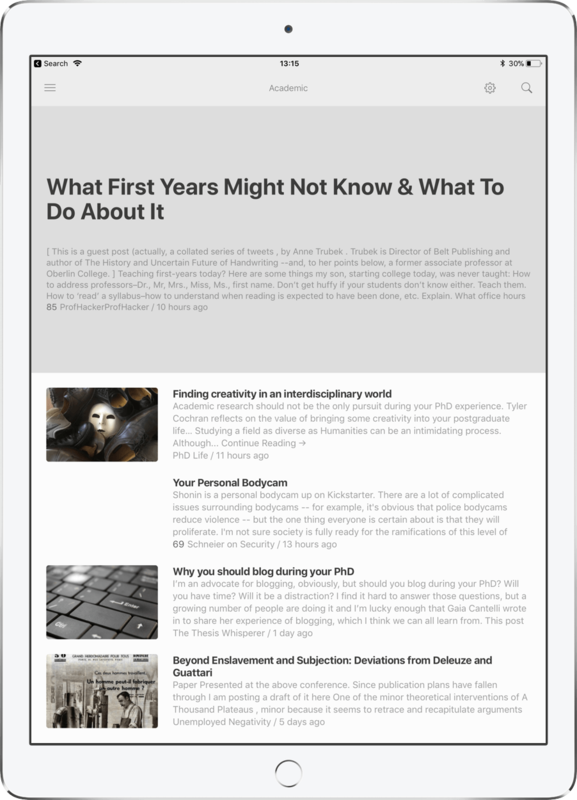 I am yet to find a better app for keeping a digital journal than this. Day One has balanced all the necessary features with nice interface design, but the Markdown support clinches it for me. This one of many apps to take up a subscription model lately, but you can access all the functionality you need to get started without throwing down more coin. This is another area I have already covered in relative detail. Despite that being a fairly recent post I have made some changes since it went up. I’m, holding out hope that Brett Terpstra’s Bitwriter is not only forthcoming, but will include an iOS app. There are also interesting changes on the horizon with Appple Notes in iOS 11, most notably with searchable handwriting. Otherwise, the following options remain worthy alternatives. 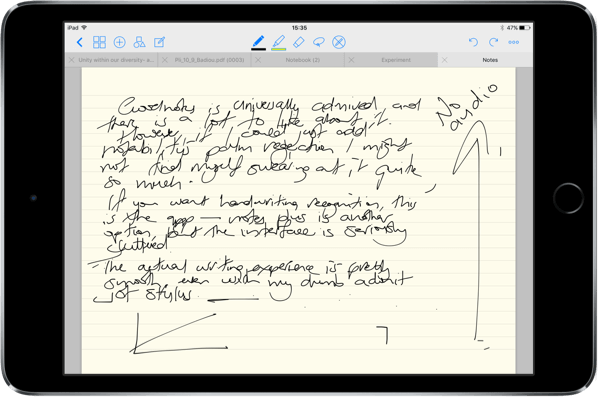 GoodNotes – For a straight up handwriting app that works well no matter what kind of iPad you are running – pro, standard, or mini – GoodNotes is going to be up there. 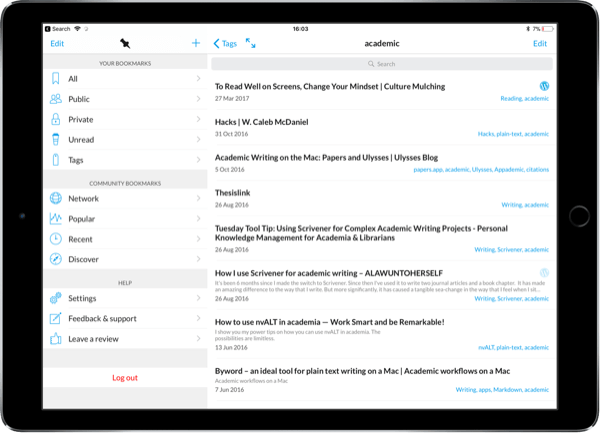 I prefer the design of Notability on the whole, but functionality matters when your notes are as crucial as they are for academic work, and GoodNotes has the killer feature for handwriting – searchable notes. Drafts – Keeping with the plain text rule, Drafts is usually my first point of capture for text, especially on the iPhone. If you are an Apple Watch user, Drafts has an excellent complication for dictation. The real utility of drafts, however, lies in its automation engine – something I couldn’t do justice to here. The screencasts on the Agile Tortoise website can get you started. Just Press Record – The native iPhone Voice Memos app does a great job of capturing audio on the fly, but accessing it on other devices can be a nuisance . Just press record solves that problem with an added bonus. It can also do some on-the-fly audio to text transcription. The results are better than expected, although I wouldn’t rely on it to transcribe entire lectures – we are not quite there yet. 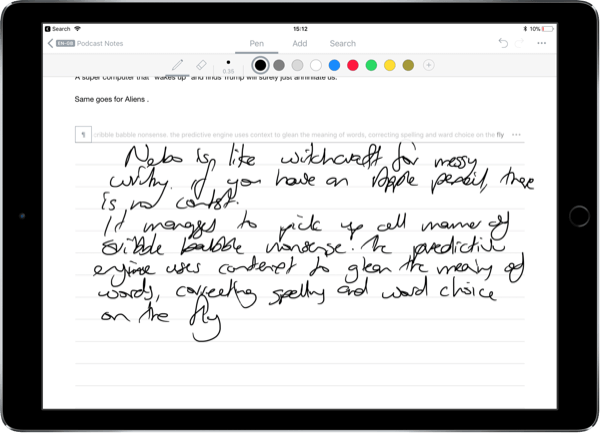 Notability – If it had optical character recognition for searching your handwriting, Notability would be the killer app for lecture notes. It gets pretty close with the ability to capture audio while note-taking; thus its appearance in this section. For students especially, the utility you can get from this one app will make it easier to bump a couple of others of your list. 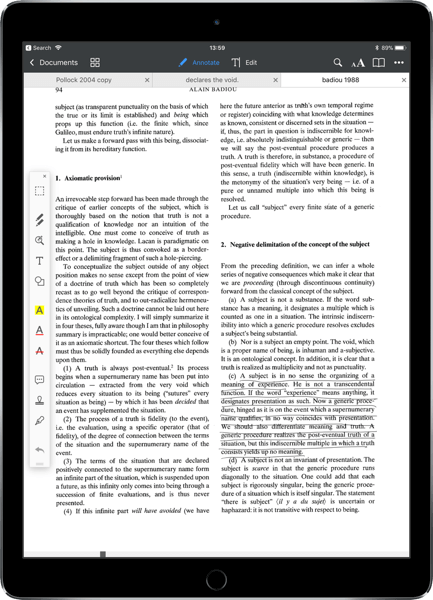 Handritten and typewritten notes, PDF annotation, and audio recording all rolled into one. Last I check it was still pretty cheap too. Ferrite stands alone as a full featured digital audio workstation for voice work. Ferrite – If you ever need to record interviews, this is hands down the best, most feature rich app available on iOS for the job. 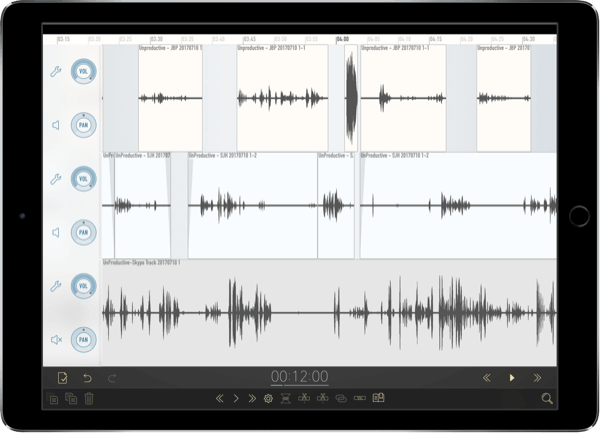 Designed specifically for voice recording and editing, it can manage anything from capturing audio presentations to producing podcasts and other broadcasts. There are some truly excellent audio recording tools on iOS these days, but most of them are aimed at musicians. With features like ducking, and silence removal Ferrite stands out as the singular app for audio voice work. VLC Player – A lot of people seem to prefer the more polished Infuse, but VLC for iOS is just as good as its desktop counterpart. There is nothing it cannot play, and unlike its aforementioned rival, it is free. Pixelmator – If you need photo editing software, the iPhone’s camera technology has encouraged a huge amount of development in this area. Pixelmator has stood out for some time as an app that goes beyond many of the filter and fix apps designed as mobile only utilities. If your needs are modest in this area, and you want an easy to learn, no nonsense app, this is it – and it is cheap. Affinity Photo – If you have more serious needs, there is only one app that can claim to be a truly professional photo editing tool to rival desktop applications. Affinity is next level stuff. 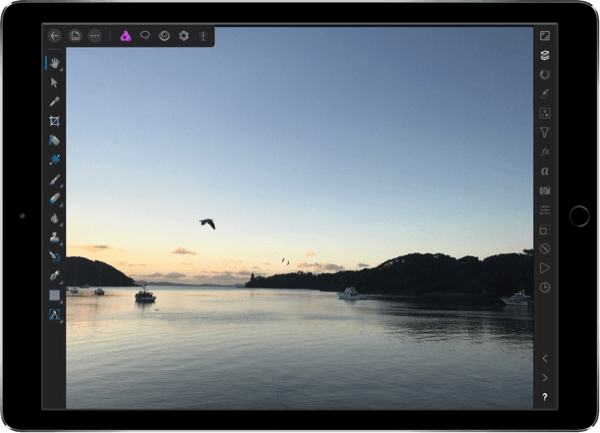 Affinity Photo is one of the first truly professional applications on iOS to rival the power of desktop software. 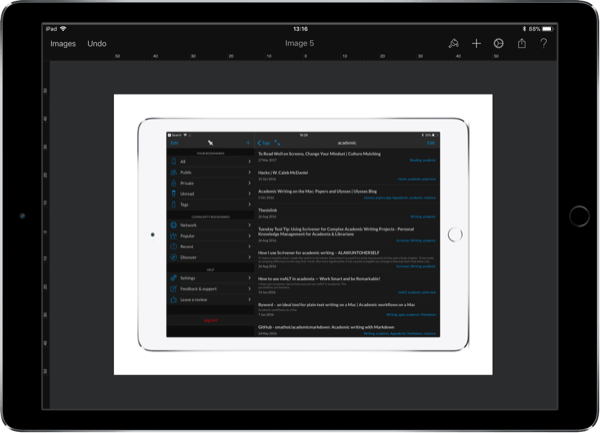 Workflow – Acquired by Apple, Workflow is not only the singular automation utility on iOS, but one of the biggest leaps forward in the evolution of iOS as an operating system for serious productivity. 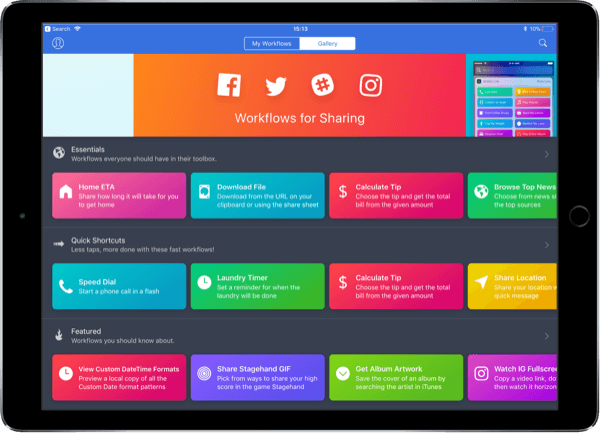 If there is anything you can’t already do on your iPad or iPhone, chances are Workflow can help you out. No programming required. Stay tuned for more on this app in future. TextExpander Keyboard – The sandboxing design of the operating system means TextExpander is not quite as useful on iOS as it is on the Mac. Yet, the Text Expander Keyboard is still well worth installing. The real value to installing TextExpander on iOS is to be found in the apps that include built-in support. Smile maintains a list of TextExpander enhanced apps here. Elsewhere snippets can still be expanded with the third-party keyboard. 1Password – Still my preferred password manager. Not only is it the best user experience, but features like Travel Mode make it an ideal choice for travelling researchers. Password management should be a no-brainer for anyone working on a university network, really it should be a no-brainer for for anyone period. Copied – Advanced, cross platform, clipboard management. Copied can do all kinds of neat things, including customisable text transformation, and synchronised clipboard history across devices. A comprehensive URL scheme opens up all kinds of automation possibilities, and a keyboard extension provides easy access to media rich clippings. Other clipboard managers exist, but nothing comes close to Copied for functionality. Prizmo to Go – There are times when you need to grab a section of text from a book, a journal article, or some random document. There are two apps that I know of that do this well, the other is Textgrabber. While they won’t capture the text perfectly every time, they come pretty close. It can seem like magic when they save you serious time. Who doesn’t need accurate weather data? Weather Underground – Weather apps are something of an iOS playground for user interface design, but where the actual weather data comes from is another story. The majority of weather apps on the App Store hook into the Darksky API, which can be hit and miss for accuracy. 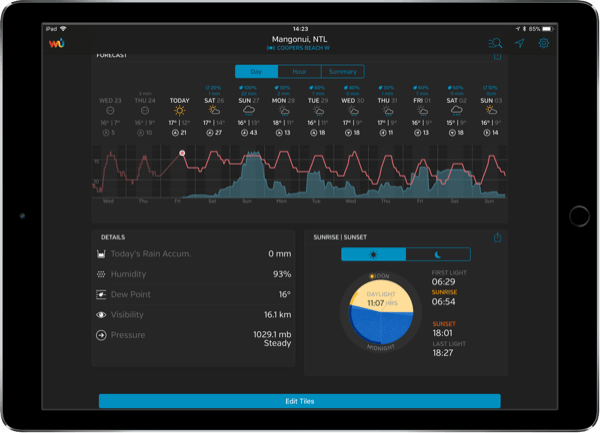 Weather Underground’s unique selling point is a vast network of local weather stations providing accurate real-time data. I also know of at least one sea captain who uses Weather Underground, so it must be good, right? I decided not to get too crazy here by starting into categories like entertainment, although I may revisit that at some point. One area I intend to delve into is audio production on iOS, but that can wait. For now, I would wager you will find on this list everything you need, and more to get serious work done. I have already said I believe there is no question the iPad can be a primary device for study or research, this should serve as sufficient evidence to support that claim. As ever, if you have any questions, if I can help in any way, hit me up via the contact details over on the left.